PacificSport VI inspires and engages our athletes, coaches, and communities as they pursue their goals. Our organization provides dedicated support to more than 100 registered athletes and coaches, in addition to hosting community sport programs and events for people of all ages. Through partnerships with recreation departments, school districts, health authorities, and local sport organizations, PacificSport Vancouver Island delivers programming for the Canadian Sport for Life movement, improving the quality of sport and physical activity in Canada. PacificSport Vancouver Island is funded by investments from the Province of BC, viaSport, and the City of Nanaimo and is a member of the viaSport Regional Alliance — a network of six PacificSport centres and five regional multi-sport leaders across the province. PacificSport Vancouver Island’s role in the community is to service sport development and physical activity in the Mid-Island area. We offer services and programs that support the Canadian Sport for Life model. What is the Canadian Sport for Life – Long Term Athlete Development model? In 2002, the Canadian government developed the Canadian Sport Policy, an initiative to enhance participation and develop capacity to grow sport excellence and sport participation in Canada (reference). To act on this initiative, Sport Canada, the government agency responsible for sport from recreation to high performance levels, invested the Canadian Sport for Life (CS4L) model and the Long Term Athlete Development (LTAD) framework. These documents provided a philosophy for encouraging lifelong engagement in sport and physical activity for Canadians. Since the introduction of CS4L and LTAD model, Sport Canada has created an adapted LTAD framework for each federally supported National Sport Organization in Canada, as well as other supporting documents to further develop the understanding of CS4L and LTAD. This is a visual representation of the Canada Sport for Life model. It is meant to encompass all Canadians involvement in physical activity and sport. The model consists of three different levels: Physical Literacy, Excellence, and Heath of the Nation. 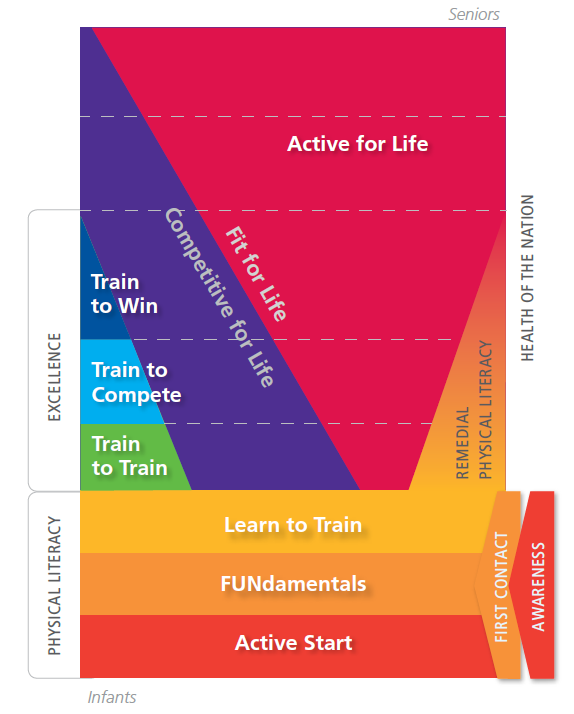 The seven stages of the Long Term Athlete Development model are embedded in the Canadian Sport for Life model. The Physical Literacy level includes Active Start, FUNdamentals, and Learn to Train. The Excellence level includes: Train to Train, Train to Compete and Train to Win. The Health of the Nation includes Active for Life, Competitive for Life. The CS4L model outlines that an individual’s involvement in sport or physical activity starts in the Physical Literacy stage where the main goal is to develop fundamental movement skills and sport specific technical training. Development from the Physical Literacy stage can move towards the Excellence stream, where there is a greater focus on training for high performance and holistic sport development, or can move towards the Active for Life stage, where a focus on an lifelong engagement in sport and physical activity is encouraged in competitive and non-competitive environments. How does PacificSport support the Canadian Sport for Life model? Grassroots programs and events that support physical literacy; fundamental movement skills; introduction of kids and athletes to skills that support active lifestyles. Performance programs that provide athletes and coaches access to training facilities and innovative sport science techniques, equipment, and services to further enhance overall development. Opportunities for sport education at all levels of CS4L pathway including seminars, conferences and workshops for athletes, coaches, and community members. Expertise, and more to support CS4l initiatives in BC.